Arjun proposed to Khushboo under cherry blossoms in New York and she self-designed her 'love story lehenga' for the wedding. Check out other interesting highlights of their emotional and exciting wedding in Goa. 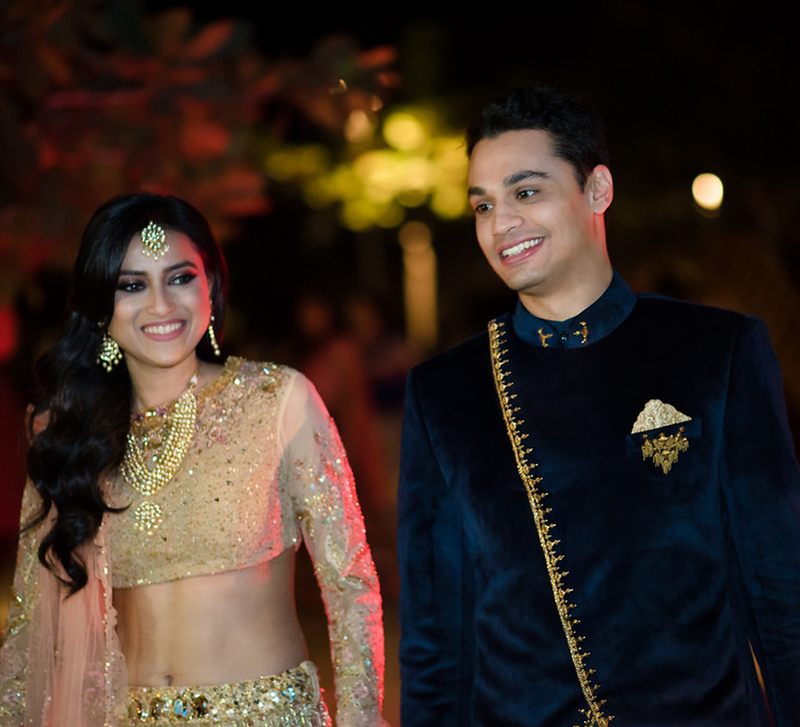 Khushboo and Arjun’s love story, which saw them in a long-distance relationship for a few years, culminated in a joyful sunset wedding on a beautiful beach in Goa. The bride, who is a fashion designer, wove her love story into her lehenga which was one of the highlights of the memorable affair at Holiday Inn Resort, Goa. 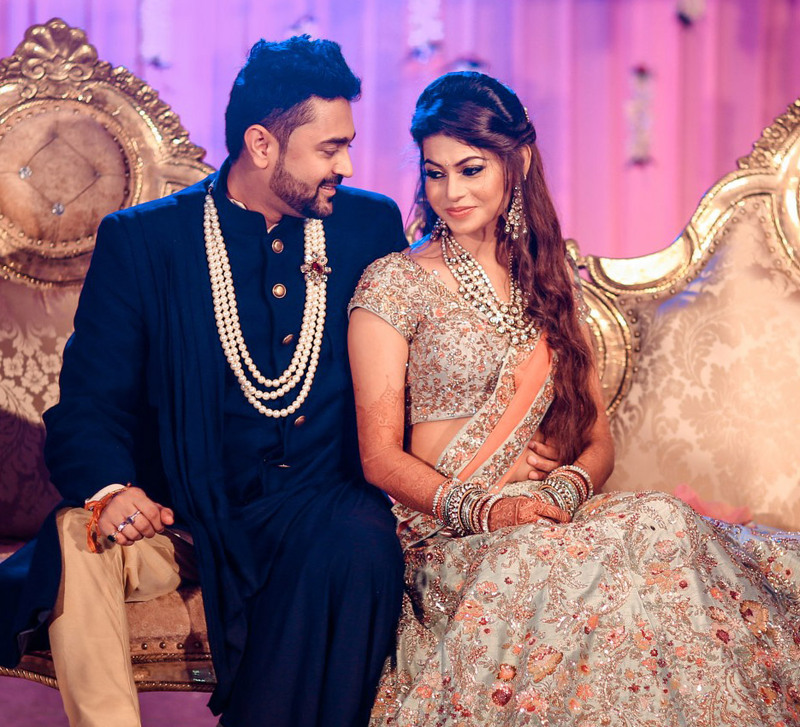 Here, bride Khushboo shares some memories, highlights and pictures of the celebrations. "Arjun and I met when we were in school when we lived in Dubai. However, we didn’t start dating then. We have known each other for 13 years, and have always been good friends. After a few years, Arjun moved to Boston for his higher education, and we lost touch as we got busy with our lives. In 2011, one fine day, we started talking again, and within a week, Arjun told me that I was the one and that he will marry me. At first, I laughed it off! It took Arjun two years to convince me as I was against a long-distance relationship. We dated for four years or so. On one of my visits to New York on 27th April, 2017, he proposed to me. Our love story is a little funny and unique. I am a fashion designer, and that’s why I had decided to design my 'love story lehenga.' I wanted to relive all our special moments on the day we got married by wearing my self-designed outfit." "Arjun and I have a history with flowers and bouquets. Since pink is my favorite color, he tried to incorporate everything special to me into the proposal. I designed a dress for myself while in Dubai, before traveling to New York. After showing it to Arjun while in Dubai, he decided to propose in the Botanic Gardens under the beautiful pink cherry blossom trees. He basically tried to revolve the proposal around my dress and it was magical just like a fairytale. 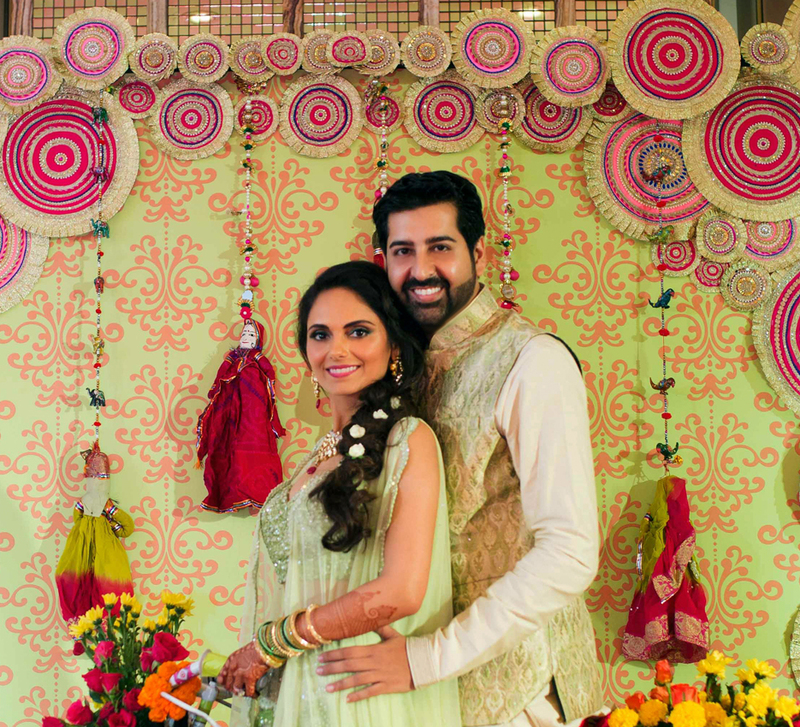 Hence, I wanted the theme for our pheras and wedding to be similar with a twist." "We chose India as our midpoint as we had people coming from all over. I always wanted a beach wedding, so Goa was a natural choice. After exploring eight venues there, we zeroed in on Holiday Inn Resort as it was very airy, open and flexible compared to other hotels in Goa. Their ballroom was a decent size, and they had lovely outdoor venues as well. Their beach venue is the most beautiful in Goa. Their resort's entire team was wonderful to work with, and we had no problems at all. I must mention that the food they served was super yummy as well." 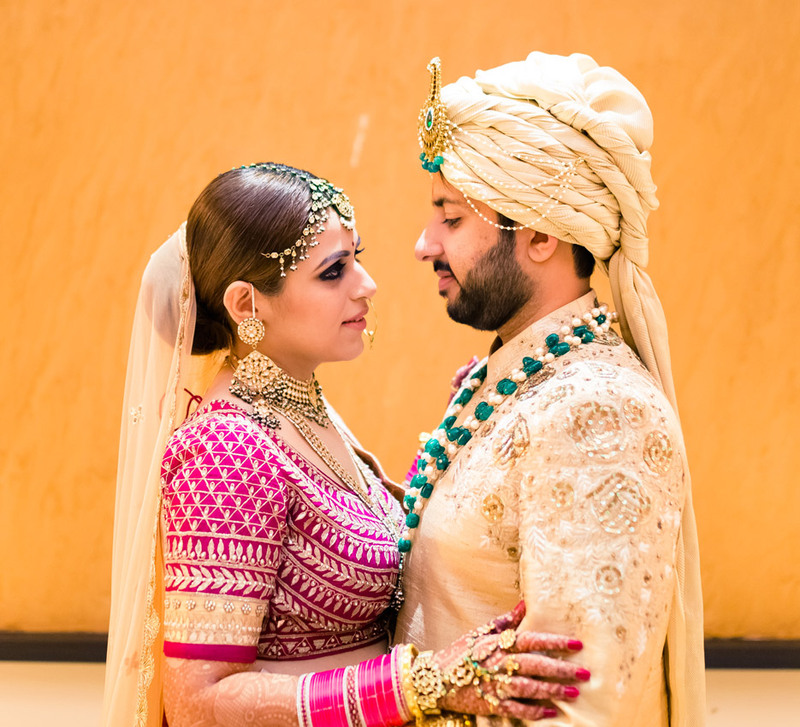 "We had a small prayer ceremony, and then we kicked off the celebrations with a small mehndi ceremony, where I had my bridal henna designs applied early. Traditional Indian drummers energized the event with their beats. This was followed by an intimate dinner." "The next day we had the outdoor pool/rain dance holi mehndi party. It was a fun event with bartenders and dreamy, whimsical decor. I went for a theme of dreamcatchers with a natural earthy vibe. We also had a dance floor with rain showers, water balloons and holi colors that people had fun flinging on each other. Some of us even jumped into the pool eventually." "The sangeet that was held in the evening was all about a trippy vibe with neon lights and electric-themed decor. We had live 'paan walas' (betel leaf sellers) who stole the show at the event. They were very entertaining and fed everyone delicious 'paan' varieties. They knew how to attract a crowd and were a hit with our guests. We had our sangeet performances and a little game for the bride and groom, after which everyone got dancing. It was a wonderful night!" "The last day, the morning started with our haldi and my 'chudda' (bridal bangles) ceremony. It was a beautiful and a very intimate function. I got a gorgeous floral dupatta made which my friends placed on me. We held our pheras on the beach during the sunset hours, and it was a magical experience. I entered the venue to a song that is very special for me - ‘Laadli’ by AR Rahman. I am the only daughter after three brothers, and it was an emotional song with a lovely beat. I wanted something meaningful but not too sad hence this song was perfect. We also had fireworks after the pheras. We hosted a reception dinner the same night where the Dubai-based band ROOH performed Sufi and dance numbers. Our guests also enjoyed a presentation of photos from both sides of our families while the DJ played till 6 am in the morning." "It can get a little hectic with all the planning but do not forget to enjoy the preparation months and especially the wedding. A lot of people had told me they never got to enjoy their wedding as too much was happening and mostly don't even get to taste the food. Arjun and I thoroughly enjoyed our wedding thanks to our wedding planning team. We wish we could rewind time and live those days all over again. Our families and friends were very supportive and also enjoyed the wedding a lot."